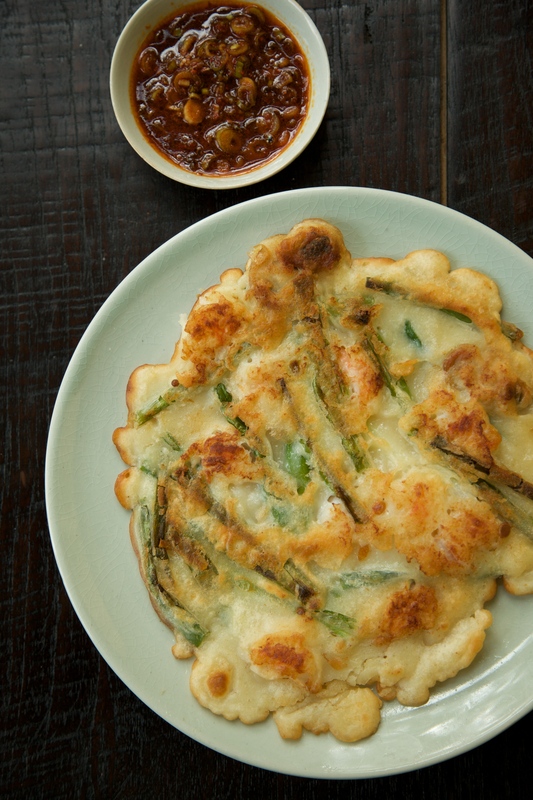 These could be called “Dont-Skimp-on-the-Shrimp-Pajeon” since they’re loaded with what my entrepreneurial husband refers to as a “a lot of merchandise.” the secret ot these pancakes, besides the generous amount of seafood, is the little bit of rice flour, the key to making them extra crispy. Alternatively, you can leave out the seafood and increase the scallions to make this dish completely vegetarian. Whisk together the flours and salt in a medium bowl. Whisk in 2 1/4 cups cold water. Fold in the oysters, shrimp, and scallions. Heat 2 tablespoons of vegetable oil in a large nonstick skillet over medium-high heat. Ladle in a generous cup of the batter (try to get an equal amount of seafood in each pancake) and cook until browned and crisp on the first side, 2 to 4 minutes. Carefully flip the pancake and cook on the second side until browned and crispy, another 2 to 3 minutes. Continue with the remaining batter and more oil as necessary.